My New Year resolutions started out on the back of a bank receipt. A random list of thoughts eventually became goals I wanted to focus on this year. One was prayer. In the rush of life, my prayers seem to have become shortened and stagnant. I walked into church late on Sunday morning. The music played; I sat in an unfamiliar spot. And I was tired. Life is weighing at times. Lyrics led to preaching and we opened our Bibles to Acts 4. On a screen I saw the words in bold print “How’s your prayer life?” It never fails, God seems to meet me right where I am. The next day, a snowy forecast made me want to linger under the morning’s warm blankets. The house was still and the floors cold. I reached for my green tattered Living Bible and read about wisdom. I traced my fingers over Proverbs 8, hoping the words seep into my soul. I finished but was reluctant to pray. Why? Maybe it’s because God really knows me. God knows my selfish ambition and my lack of patience and the thoughts of past and present that rumble through my mind. And the morning rolled on. I fixed breakfast and placed it on the table. Distracted with pouring and stirring, I saw Luke waiting for me. His soft little hands folded, he was waiting for me to pray with him. And I was quickly reminded through this baby of mine that prayer isn’t meant to be difficult. Its simple words to the one that gives us life and joy and everything we have but don’t deserve. And I bowed my head beside this little boy who is yet to make prayer complicated. “I tell you the truth, anyone who will not receive the kingdom of God like a little child will never enter it.” Mark 10:15 Jesus knew some of our greatest teachers here on earth would be our children and our grandchildren. Out of the mouths of babes. your posts all touch my heart. I couldn’t possibly love this more. That picture is a treasure, you know. This is simply an awesome, wonderfully written post. I love it and am so touched by your thoughts about uncomplicated prayer. 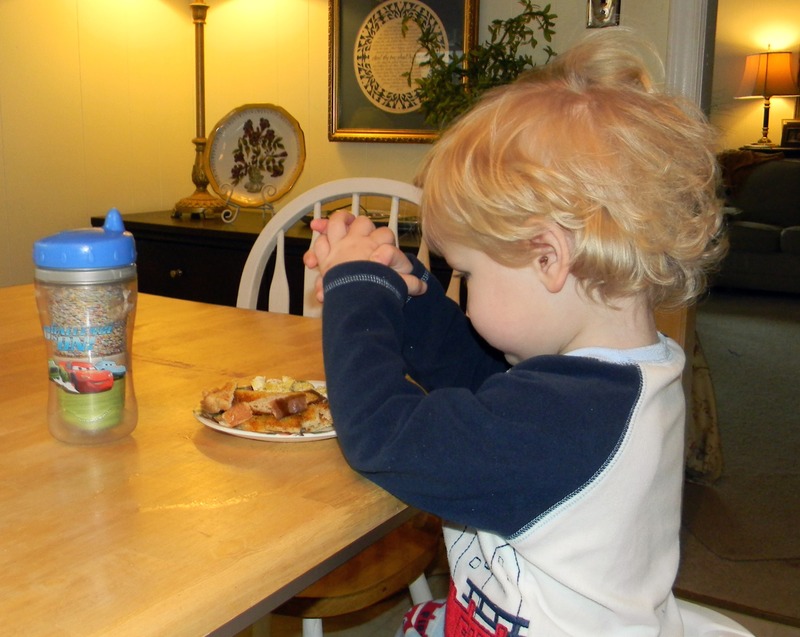 Oh that Our Lord make me so uncomplicated like your little boy Luke….what a prayer warrior he is becoming! Thank you for this…it has made me still and caused me to appreciate the simplicity of Our Lord! Thank you also for stopping by the cottage…I hope to see you again. Oh my goodness … goosebumps. What a perfect post. That photo says it all. Wow! Thank you – I also need to follow your little one’s example! I love this — beautifully written and honest, Amanda. I have a lot of trouble with prayer…but I have to say, making it part of my morning routine has really helped in the last couple of months. I read a few verses of the Bible and then pray with a warm cup of coffee in my hands. On the mornings that I blow off Bible reading and prayer, my day is off to a much worse and frentic start.